A new shop in south London, The Beehive, is set to become a new mecca for fans of retro music, clothing, and accessories. from nearby Stockwell Street Market have jointly taken over the running of the premises to offer a unique ‘four-in-one’ shopping experience. Calneva Vintage Collectibles, aka Frances, sell 1950s and 1960s collectibles for the modern home. 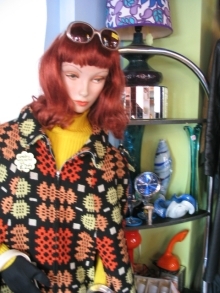 Alongside her is Ollie, who deals in a wide range of vintage clothes and accessories. Thirdly we have Casbah Records, run by Graham, who specialises in a range of ’60s music genres, selling both original and reissue CDs and vinyl. And last but not least we have coffee provided by the people behind London Coffee Roasters, to help you relax with a well earned break. Sounds like a great place to spend an afternoon. Calneva and Ollie started trading last week, and the finishing touches to the remainder of the shop are being made now, and will be open we’re promised by the 8th of March. Why not pop down soon: and say we sent you, of course. The Beehive, 320-322 Creek Road, Greenwich, London, SE10 9SW. DLR: Cutty Sark.